Convert your points to a €50 Dulux Cash Reward to use against your next purchase of Dulux or AkzoNobel products at your Home Store, which means real savings for your business. NOTE: Cash Rewards are only valid for use in selected stores, see terms and conditions for further details. 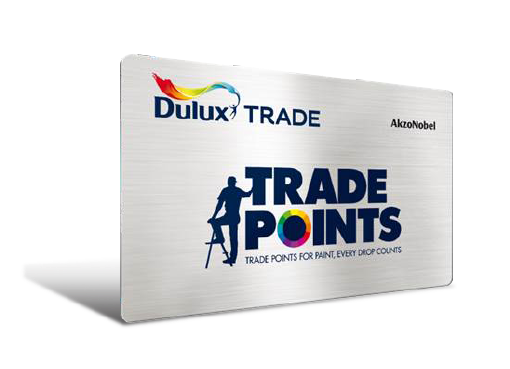 If your store cannot accept Dulux Cash Rewards then you can convert your points to money-off Dulux products automatically at the till simply by presenting your Dulux Trade Points loyalty card. Click 'Redeem' and your €50 Dulux Cash Reward will be emailed to you, ready for you to print out and use at your Home Store. 1. This Dulux voucher is only valid for Dulux and/or AkzoNobel products purchased in selected participating stores: Dulux Trade Centre, Fullers Paints, MRCB and/or Stillorgan Décor from March 1, 2017 until 12 months from the date of issue of the Dulux voucher only . 2. Dulux Vouchers are only redeemable at the Trade Points members “Home Store”. To find your home store, visit your Manage My Account page on www.duluxtradepoints.ie. 3. This Dulux voucher entitles the holder to the discount as stated on the voucher. 4. There is no cash alternative. No change or alternative will be given. The voucher is non-transferable, non-negotiable, non-exchangeable and non-refundable. 5. A unique code to the value of the Dulux voucher will be e-mailed to the members’ registered e-mail address. 6. Trade Points members must print out a copy of the email received. Only hard-copy print outs of the email will be accepted. 7. 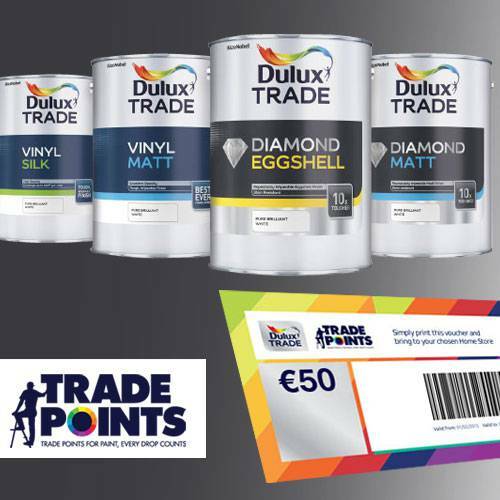 Trade Points members must present the unique Dulux voucher code at the point of sale, at the time of the transaction to redeem the value amount. 8. Products are subject to availability. 9. Only original vouchers will be accepted. This voucher can only be used once and cannot be used in conjunction with any other offers. Photocopied, damaged or defaced vouchers will not be accepted. If there is any reason to believe that a voucher holder has breached these terms and conditions and/or tampered with a voucher, the Promoter may, in its sole discretion, refuse to accept the voucher. 10. This promotion is open to all Ireland residents aged 18 and above except employees of the Akzo Nobel N.V. group of companies, their families, their agents or any other person connected with this promotion. 11. All voucher holders agree to be bound by these terms and conditions. Please keep a copy of these terms and conditions or contact the Promoter for a copy. 12. The Promoter reserves the right to amend, cancel or withdraw this promotion in whole or in part, temporarily or permanently, at any time without prior notice or compensation. PROMOTER: Dulux Paints Ireland Limited, Commons Road, Cork, Ireland.